We used to say that software is eating the world, but the fact is today software is the world. Gone are the days where IT could be treated like a utility, one that more often than not was outsourced in the belief that you needed to focus on your core competencies and IT didn’t make it onto that list. These days being competent at IT is mere table stakes at best, you need to excel at IT if you hope to become an industry leader. Today business executives must focus on disruptors, new competitors entering their market space using technologies in new ways. Becoming an agile business – an adaptive, responsive, and learning organization – is the true goal. Business agility requires true agility across all of your organization, not just software development, not just DevOps, and not just IT. There isn’t a single industry now that either isn’t dominated by agile businesses or isn’t under threat of disruption by new agile competitors. We created Disciplined Agile for Executives to help business leaders compete and win in this new world. Disciplined Agile Delivery (DAD) was created to apply agile in complex enterprise agile implementations. DAD has been well received and implemented in organizations around the world. “Success with agile development is important, but comes in different forms across enterprises. Technical professionals responsible for application development can use Disciplined Agile Delivery to tune agile processes and practices, including SAFe, to their specific needs." Why Choose a Certified partner? 1. DA takes the mystery out of agile software development. Software development is inherently complex. Disciplined Agile (DA) describes how: Agile solution delivery works from beginning to end in a streamlined manner; All aspects (analysis, architecture, testing, …) of solution delivery work; These aspects fit together in a pragmatic manner. DA provides a comprehensive description of how agile works in practice. 2. DA speeds up your agile transformation. Agile transformations, and process improvement in general, take time. Disciplined Agile (DA) encompasses: The principles and philosophies for “being agile”; Lifecycles and practices for “doing agile”; Advice for how it all fits together in a comprehensive whole. DA shares proven strategies that would normally take months or years for you to figure out on your own. 3. DA enables context-sensitive process choices. Every person, team, and organization is unique in their own way. Prescriptive, “one size fits all” strategies don’t work well in practice. There is no silver bullet method applicable to all enterprises and all solutions: Disciplined Agile is inclusive of other well established methods and practices, rather than exclusive. Disciplined Agile (DA): Makes your process choices explicit via its goal-driven approach; Supports multiple lifecycles (A Scrum-based agile lifecycle, a lean lifecycle, a continuous delivery lifecycle, and an exploratory lean start-up lifecycle); Provides light-weight guidance for making effective choices. Choice is good, making intelligent choices is better. 4. DA extends Scrum. The Scrum method is purposefully sparse, leaving most process details up to you. Determining how to make Scrum work in practice can be a slow and expensive strategy: ”Failing Fast” as a mechanism to learn and adapt has merit, but applying proven techniques from Disciplined Agile reduces failure in the interest of “Succeeding Earlier”. Discipline Agile (DA): Extends Scrum to address the full delivery lifecycle; Describes how to address technical aspects of software-development – including analysis, design, programming, testing, deployment, and more - that Scrum purposefully doesn’t; Describes how to govern Scrum teams in an agile/lean manner. Disciplined Agile does the “heavy lifting” on process issues that Scrum leaves to you. 5. DA provides a foundation to make SAFe work. The SAFe framework is sparse when it comes to solution delivery details. SAFe is very prescriptive and targeted at a narrow problem space. SAFe has more than 35% waste built into its framework for managing, planning, and coordinating large groups of agile teams. 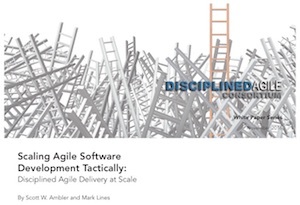 Disciplined Agile (DA): Supports many delivery lifecycles to accommodate Scrum, Lean, and other philosophies; Takes a flexible, goal driven approach; Addresses aspects of IT that are missing or very sparse in SAFe; Promotes respectable certifications that must be earned, not bought. Disciplined Agile provides the solid delivery foundation missing from SAFe. 6. DA provides a foundation from which to scale agile tactically. Organizations are now applying agile techniques on on large teams, on geographically distributed teams, in regulatory situations, using complex technologies, and addressing complex problems. Disciplined Agile (DA): Describes agile solution delivery comprehensively; Surfaces process decisions and gives people practical choices; Promotes a light-weight, governed approach to solution delivery. DA provides a solid foundation from which to scale tactically. 7. DA shows how to scale strategically to IT. To succeed in the marketplace you need an agile IT organization to support your lean enterprise. Disciplined Agile (DA): Shows how to optimize workflow throughout the entirety of IT; Describes a flexible, goal-driven approach to critical IT activities such as portfolio management, enterprise architecture, data management, reusing engineering, and more; Supports a comprehensive, disciplined approach to DevOps. DA shows how to optimize the whole of IT, not just locally optimize software development. 8. DA is enterprise ready. Agile strategies are being adopted in enterprise-class settings that have significant legacy investments in technology and people experienced in traditional IT. There is significant technical and cultural debt to be overcome. Disciplined Agile (DA): Focuses on solutions, not just software; Promotes enterprise awareness and optimizing the whole; Supports agile/lean governance and leadership strategies. 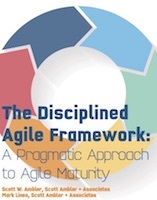 DA provides pragmatic advice for apply agile strategies in enterprise-class environments. 9. DA evolves empirically. We’re constantly learning as practitioners, learning about and experimenting with new agile and lean strategies all of the time. These learnings are constantly being applied to evolve Disciplined Agile. 10. DA is pragmatic, not purist. Disciplined Agile is being applied by teams: in sizes from 2 - 100+, co-located to globally distributed, for life-critical compliance, with offshore team members, for simple to very complex problem and technical domains. Your teams need to tailor their strategy to address the situation that they face, and sometimes that’s not “pure agile”. 11. DA increases the chance of success of your agile transformation. Agile transformations must address the inherent complexities of your organization. Disciplined Agile addresses the full range of issues that you will run into when transforming your organization, providing insight into how to apply agile strategies in your actual environment. View the results from the 12th Annual State of Agile survey by VersionOne. In part, this research finds that the Disciplined Agile (DA) Framework is the scaling approach that saw the largest increase in reported use since last year. Many organizations around the world have selected Disciplined Agile as their standard agile/lean framework for implementation of their IT solutions. The Certified Disciplined Agile Partner Program provides service providers and educators an opportunity to demonstrate to these organizations that they have the required delivery skills, experience, and delivery capacity to meet the needs of these customers. Ready to enable your business leaders and entire organization in becoming a Disciplined Agile Enterprise? Contact a Certified Partner. Need more information? Contact Us. A Certified Disciplined Agile Coach (CDAC) indicates that each coach is a trusted expert with significant proficiency in Disciplined Agile. They are able to coach other people in disciplined agile strategies and advise organizations in the adoption and tailoring of Disciplined Agile. Pass the board interview - The most important aspect of the CDAC application process is the Coaching Review Board interviews. Applicants are interviewed by several existing CDAC's about your agile and lean experiences and about how you approach coaching situations. Certified Coaches are expected to actively evolve Disciplined Agile, and are required to keep their DA knowledge current. When your organization chooses to transition to more agile and lean ways of working you quickly discover that this effort needs to address all aspects of your organization, not just your solution delivery teams. Many transformation efforts invest in agile team coaches, which is a very good thing to do, but will often shortchange other areas of coaching in the belief that they’ll figure it out on their own. It may work out that way, but even when it does this is an expensive, slow, and error-prone approach. In our experience it’s far better to get help from an experienced Enterprise Coach. An Enterprise Coach coaches “beyond the team” to help senior managers and leaders to understand and adopt an agile and lean mindset. This requires a similar yet different skill set than what is required for team coaching. We have adopted a Shu-Ha-Ri strategy for this certification program. Shu-Ha-Ri is a martial arts concept that represents the stages of someone's learning. 1. Certifications must provide value. First and foremost, a certification must provide value to the person being certified. This value comes from learning new and valuable strategies during the process of earning the certification as well as greater employability resulting from the certification. Of course there are always limits to the value of any certification. 2. Certifications must be earned. The effort required to earn the certification must be commensurate with the value provided. For example, it is easy to earn your CDA because it is an indication that someone has basic knowledge of Disciplined Agile (DA) and wishes to learn more. The CDAP is harder to earn because it is an indication of both knowledge and experience. CDAC is very difficult to earn because it's an indication of expertise and competence. 3. Certifications must be respectable. We believe that the Disciplined Agile certifications are respectable for several reasons. First, the fact that you have to do some work to earn them is a welcome difference from other agile certifications. 4. Certifications must be focused. The focus of this programme is on Disciplined Agile approaches to IT solution delivery. Disciplined Agile certifications are an indication of knowledge and experience in the Disciplined Agile framework. 5. Certification is part of your learning process. Disciplined professionals view certification as part of their learning process. Learning is not an event but instead an ongoing effort. The implication is that once you have earned your certification you must continue working to keep your skills up to date. 6. Certified professionals have a responsibility to share knowledge. Not only have we adopted the concept from martial arts, we have also adopted the mindset that people have a responsibility to help teach and nurture people to learn new skills and knowledge. The act of teaching and sharing information often leads one to a greater understanding and appreciation of the topic, and thus helps the teacher as well as the student to learn. Ready to learn how to transform your organization into a Disciplined Agile Enterprise? Contact a Certified Instructor. Need more information? Contact Us.